We carry a wide selection of casino quality, razor edge precision dice in a variety of styles and colors. Our Casino Dice are perfectly shaped and balanced to ensure an even distribution of rolls. That's why these are the exact same dice you'll find at many of the world's leading casinos. You can choose from Flush Spots Dice, Bird's Eye Dice, and Ring Eye Dice with or without serial numbers. We also offer Custom Imprinted Dice that feature your design around the one dot, between the two dots, or on all six sides (the minimum order for Custom Imprinted Dice is 100 pair). 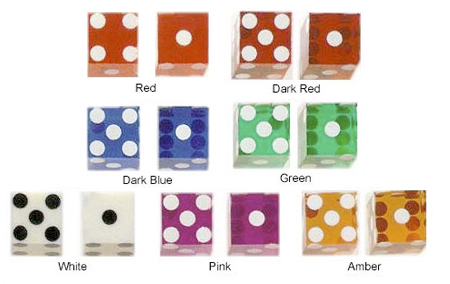 Flush Spots Casino Dice are available with or without serial numbers in the following colors: Amber, Dark Blue, Dark Red, Green, Medium Red, Pink, and White. These 3/4" high polish, razor edge Casino Dice feature the classic Flush Spots design. Flush Spots Casino Dice are available with or without serial numbers in the following colors: Amber, Black, Dark Blue, Dark Red, Green, Medium Red, Pink, Tangerine, and White. Our 3/4" Bird's Eye Precision Dice feature razor edges and a high polish finish. 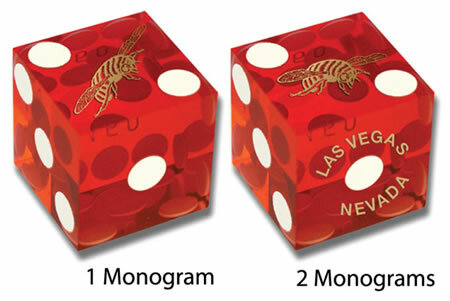 Bird's Eye Casino Dice are available in red, with or without serial numbers. Our 3/4" Ring Eye Precision Dice feature razor edges and a high polish finish. Ring Eye Casino Dice are available in red, with or without serial numbers. If you're looking for Custom Casino Dice like the ones used in Las Vegas, then you've come to the right spot! Our Custom, High-Polish Razor-Edge Dice are the same ones found at many of the world's most exciting casino crap tables. These Transparent, Flush Spots Casino Dice are 3/4" (0.75 inch), and they feature your logo between the two dots or around the one dot in a circular layout (see example below). Made of durable acrylic plastic, our High-Polish, Razor Edge Custom Casino Dice come in your choice of Dark Red, Medium Red, Tangerine, Blue, Green, or Purple. The Dice are available with the following hot stamp foil colors: blue, gold, green, white, or silver. The minimum order for Custom Razor-Edge Casino Quality Dice is just 100 pair. Standard production time is up to six weeks after proof approval.